« Faster than a speeding bullet! In Nathan’s room, we keep the bookshelf sequestered behind a Rubbermaid tub and Paul’s great-great-grandmother’s rocking chair so that Nathan doesn’t try to climb the bookshelf or inadvertently pull it down on top of himself. We place the rocking chair in front of the bookshelf and tie a string from the doorknob to the handle of the chair so Nathan can’t slam the door (which he loves to do!) and the Rubbermaid tub is there to prevent him from crawling behind the rocking chair. The very bottom shelf of the bookcase houses some stuffed animals that used to belong to me and Paul, and the shelf above that holds some of Nathan’s books. Nathan loves his books. LOVES them. To the point that I read him multiple books multiple times a day, and he STILL cries when I finish each one. Well Nathan, being the tester of boundaries that he is, wasn’t going to let an old rocking chair and a silly Rubbermaid tub cramp his style. No, sir. So what did the benevolent little dictator do? Why, he mustered all his strength and somehow managed to pull the rocking chair away from the door, still tethered to the doorknob, and made a beeline for the shelf with all the stuffed animals and his books. That kids loves his books. He got a couple stuffed animals out, but he got every single one of his books off the shelf and scattered them around himself. He tucked his legs under the rug and thoroughly enjoyed himself as he “read” each of them. 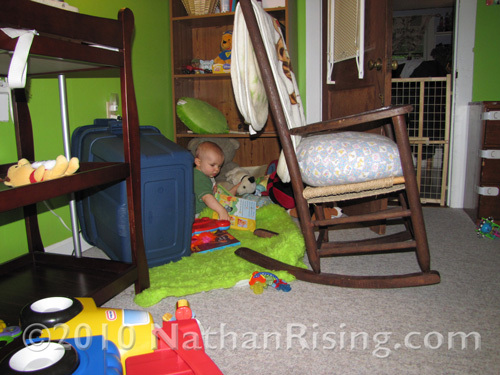 This entry was posted by Jen on June 29, 2010 at 7:24 pm, and is filed under Oh the things Nathan does. Follow any responses to this post through RSS 2.0.You can skip to the end and leave a response. Pinging is currently not allowed.